Sheldon's Picks are a set of reskins of existing weapons with new sub and special weapons. They are each the third variation of their respective main weapon (excluding single-player reskins), and are all Sheldon's Picks-branded. Sheldon's Picks were first announced during the 3 March 2016 Nintendo Direct presentation and were released in two volumes. The first came on 13 April 2016 as part of Version 2.7.0 and the second was added on 8 June 2016 part of Version 2.8.0. All of them are unlocked at Level 20, with the Tempered Dynamo Roller and Aerospray PG also requiring the fifth and third Boss Scrolls, respectively. 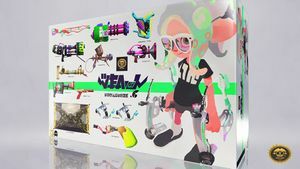 In Splatoon 2, Sheldon's Picks' role as the series of third variations of weapons initially seemed to be taken by the Kensa Collection. 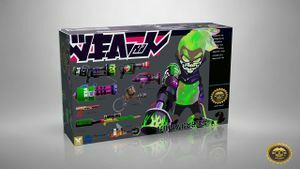 However, on 27 January 2019 at the fourth Splatoon Koshien Tokaigi (Japanese Splatoon 2 championships), it was announced that all weapons that appeared in Sheldon's Picks in Splatoon but did not receive a third variation in the Kensa Collection will return in Splatoon 2 in a future update. The announcement also contained new renders of the returning weapons and was later published on social media. On March 30th, it was announced that Sheldon's Picks will be added to the game in Version 4.6.0, released on 2 April 2019. 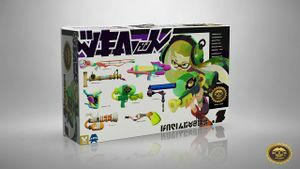 The same announcement also revealed two brand-new weapons added to the set, as variants of weapons that did not exist in Splatoon. Sheldon's Picks in Splatoon 2. The border of Sheldon's Picks logo resembles the border of the Nintendo Seal of Quality. The title on the upper-left of the box is a bilingual ambigram, "WEAPON" and "ブキセット" bukisetto (lit. weapon set). The Inkling Boy on the Volume 2 box art in Splatoon appears as an alternate skin for the Inkling in Super Smash Bros. Ultimate. Notably, 6 of the 10 returning Sheldon's Picks weapons in Splatoon 2 kept the same Sub Weapon between games. The N-ZAP '83, Heavy Splatling Remix, and Permanent Inkbrush however did inherit subs which had been previously used by their Splatoon alternate kits. A version with the ? Ink globs on the box. Promo for Sheldon's Picks Vol. 1 of the box. Promo for Sheldon's Picks Vol. 1 with five of the included weapons. Several Inklings gathered around a box of Sheldon's Picks. Closeup of the Inkling with the Wasabi Splattershot. Sheldon's Picks box at The Reef. ↑ Second announcement of Sheldon's picks by NintendoNL on Twitter on the 31st of March. This page has been accessed 88,974 times.